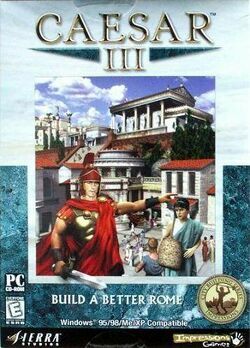 Caesar III is a video game developed by Impressions Games and published by Sierra Entertainment; the third installment of the Caesar series, part of Sierra's City Building Series. It was released in September 1998. Cities in Caesar III try to accurately reflect the life of Roman citizens – the lowest plebs live in tents and shacks, while the richest patricians live in villas. Staple foods include wheat, fruits, and pork, and wine is required for some festivals and houses. Citizens wander the streets in their various garbs and can tell the player their name and how they feel about the city. The city is viewed in a two dimensional isometric view with a fixed magnification level, and can be rotated ninety degrees. This page was last edited on 16 August 2016, at 16:13.